On May 23, 2017, the long awaited signing of the Construction contract for the renovation and transformation of Christ Cathedral will take place. This moment has been a long time in coming. The project is anticipated to take 20 months. In light of this historic moment for us in the Diocese of Orange, the following reflection that I gave some years ago in Salt Lake City, may be of interest to my readers! A number of years ago, I was spending a quiet morning at my mother’s home on my day off, enjoying my morning coffee and reading uninterruptedly the morning paper. Mom was off somewhere and I had the house quietly to myself. Just as I was relishing this wonderful moment of peace and quiet, the front doorbell rang. For one brief moment, I wrestled with, “should I or shouldn’t I answer the door?” – but in no time I found myself walking toward the front door. As I peered out the window, I noticed two bicycles parked on the side walk – a mild grimace came over my face. However, it was too late to turn back. Looking through the small window in the door, I spied two young men with white shirts and black ties – as clean as a whistle. It was too late. I had to open the door for my Mormon visitors. However, what initially began with trepidation ended with a moment of grace and blessing. After their well-versed introduction, I thought again to myself “should I or shouldn’t I” disclose who I am? I decided, for the sake of full disclosure, to fess up and tell them that I was a Catholic priest on his day off and quite contented with my faith life in the Catholic Church. I then invited them in for a chat which eventually led, to my great surprise, to a question by one of the missionaries. After hesitating for a moment, he asked me, “What was so distinctive about Catholicism?” After pausing for a moment, I responded that it was our “sacramental perspective on life”. I spent a few moments “unpacking” what I meant by that statement. I explained that we Catholics reverence all of created reality as potentially “revealing” or “disclosing” something of the "holy" in our lives. This “sacramental” perspective enables us to see such simple, earthly elements as water, bread, wine, oil, the human touch, word spoken, the imaginative turn of a Mozart symphony, a child cradled in her mother’s arms, prisms of light shining through a stained-glass window, - these and countless other moments in life as graced doors that can open for us a glimpse of the holy presence of God, the all holy creator and sustainer of all life. My friends, it is within this sacramental perspective or through the gift of our analogical imagination, as the theologian David Tracy would call it, that a Cathedral Church can be a powerful presence of the holy, revealing or disclosing the God of mercy, the God of justice, the Lord of beauty and the God of hospitality in the midst of the secular city. Our Cathedral Churches strive to be places of mercy and compassion. St. Augustine powerfully reminded the people of his Cathedral Church in Northern Africa in the 5th century “to be what you celebrate”. The Cathedral Church is the privileged place where the Shepherd of the local Church leads God’s holy people and nourishes them with the sacramental life of the Church. At the center of our liturgical life stands the Eucharist that for 2000 years has shaped our identities as Catholic Christians. Augustine again reminds us, “What you receive is what you are, the Body of Christ – say “Amen” to what you are and be what you celebrate”. The authenticity and true splendor of Cathedral worship must be gauged by the splendor of its care for those who live on the margins of society – the sick, the elderly, the homebound, homeless and helpless. Cathedral Churches are sacraments of justice in the quality and effectiveness in which God’s holy word, sharper than any two edged sword, is proclaimed day in and day out. From the cathedra – the Bishop’s chair – the good news of God’s liberating love is proclaimed – bringing “good news to the afflicted…liberty to captives, sight to the blind, letting the oppressed go free…” In the midst of a world enslaved by the lie of self sufficiency, a culture of death that views the ultimate value of life from the perspective of productivity and expediency, a society that is so often addicted to its pursuit of finding love and fulfillment in all the wrong places, there is a hunger to hear the liberating word of God proclaiming what we need to hear rather than what we may want to hear. Our Cathedral Churches must be places were the truth of the Gospel is proclaimed with integrity. Cathedral Churches are a sacrament and sign of God’s presence that comes to us in beauty. The language of sacrament is the language of sign and symbol. Words fail when we try to capture the meaning of life’s deepest realities. Can we capture in words alone the depth of the love between husband and wife? Can we explain in words alone the courage and commitment that brings a soldier to lay down his or her life in defense of their country? The most profound realities in life are more often than not expressed through sign and symbol – a kiss, embrace, a flag at half staff, a lone trumpet playing taps. The language of worship, is so often the powerful and engaging presence of the beautiful in our lives. 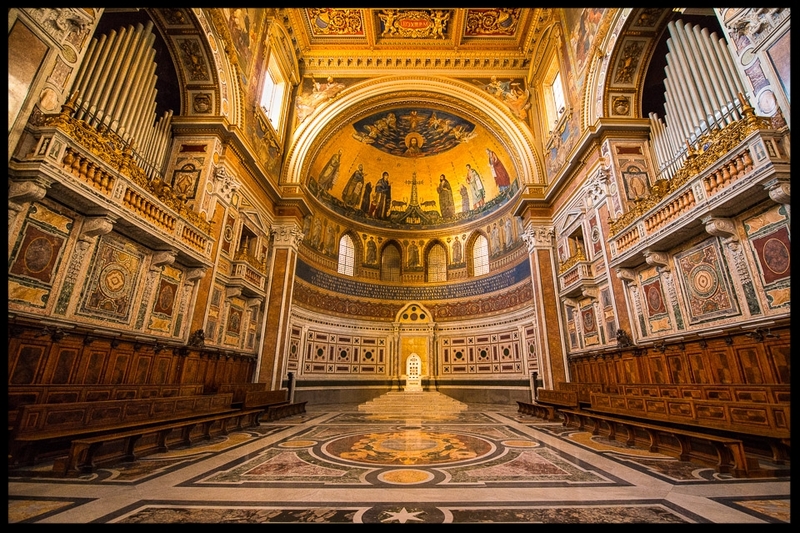 For centuries, we Catholics have wisely shaped our liturgical celebrations and particularly those in our Cathedral Churches in beauty – the beauty of soaring architecture, of sacred imagery that spans the centuries, the beauty of the poetic word, and most especially the power and beauty of music. A Cathedral Church must vigorously foster and encourage the light of the beautiful in the midst of so much darkness that surrounds us each day. Finally, a Cathedral Church is called to be a sacrament of hospitality in the midst of the city. It is truly to be a “Cathedral for all people.” I’m sure you are all familiar with the ancient concept of “sanctuary” that has its origins in the sacredness and inviolability of our places of worship. Those seeking refuge for whatever reason, could find solace and safety in the walls of our Churches. While civil law technically no longer recognizes such a concept, nevertheless, our Churches and most particularly the Bishop’s Church, must continue to be a haven of hospitality where all God’s children have a place at the Table and can feel safe in its sanctuary. In a society that is quick to judge, to segregate, to exclude, to marginalize, to characterize some as second class, whether overtly or subtly, in the Cathedral Church all should be able to find a place where they are greeted with the dignity that befits the children of God. For us in Orange who celebrate our rich multicultural diversity, a Cathedral Church that highlights this sense of sacred hospitality is critical. "When the vision of God's being and doing has become weak, theology becomes defensive - and so do Christians in general and priests in particular...But somehow or other, we all have to undergo a fairly fundamental conversion from seeing revealed truths as a possession to be guarded to seeing them as a place to inhabit; not our bit of territory that needs protection, but the whole world renewed. We shall not proclaim Christ effectively if we are constantly revisiting what makes us anxious rather than what makes us grateful!" As the great project of transforming Christ Cathedral into our Mother Church gets underway, let us not be anxious but rather grateful for the “sacrament” that it can be for our local Church of Orange.